high quality of the services on offer, allowing the resort to take up a top position among Sardinia’s family-oriented hotels. The spectacular location makes the resort truly unique: a Mediterranean oasis of relaxation overlooking a private bay. 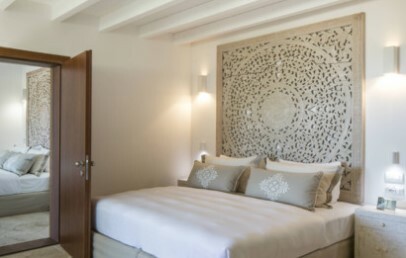 The Falkensteiner Capo Boi Resort is located a few kilometres from the lively town of Villasimius, and is surrounded by the breath-taking beaches of one of Sardinia’s most popular coasts. The resort’s privileged location, at the heart of a private bay, offers guests spectacular views of the marine protected area of Capo Carbonara. The Capo Boi Resort is approx. 56 km from Cagliari-Elmas Airport. Enveloped in a luxuriant garden, Falkensteiner Resort Capo Boi is a welcoming Mediterranean oasis nestled between the granite rocks of the countryside and the crystal-clear waters of Villasimius. 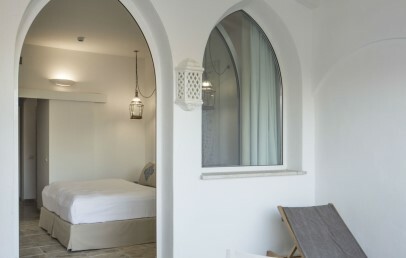 The Arabic-style lines that make the building stand out are elegantly repeated inside with a fresh style featuring overwhelmingly white shades and sophisticated furnishings and fabrics. The Falkensteiner Capo Boi Resort has 122 rooms and suites spread between the main building, the “Garden” annex and the villas. The jewel in the resort’s crown is its beautiful infinity relaxation pool located just a stone’s throw from the private beach with spectacular views over the sea opposite. The room surfaces are between 24 and 55 sq.m. and all offer a fresh and refined style. 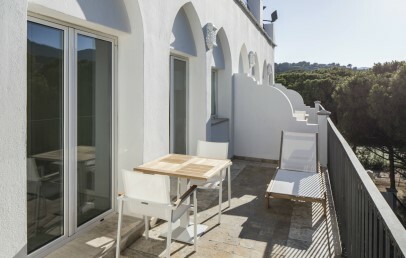 All rooms have Wi-Fi connection, independently-controlled air-conditioning and LCD satellite TV, as well as a terrace or balcony. 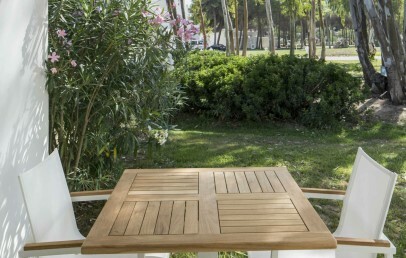 Family Room Park View – 36 sq.m., double bed, sofa bed, en-suite bathroom with shower, balcony or terrace, park view. Junior Suite Lateral Sea View – 33-43 sq.m., double bed, sofa bed, en-suite bathroom with shower, balcony or terrace, lateral sea view. 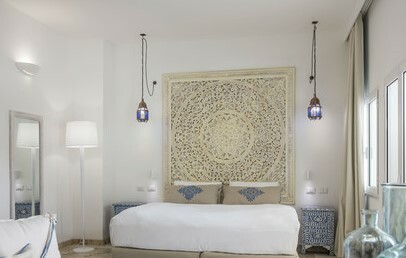 Junior Suite Sea View – 33-43 sq.m., double bed, sofa bed, en-suite bathroom with shower, balcony or terrace, sea view. 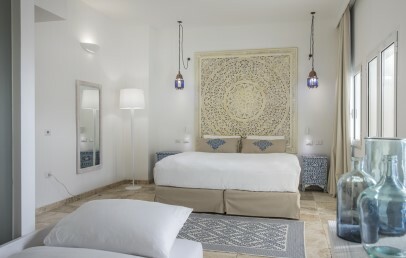 Family Suite Garden – 42 sq.m., double bed, 2 twin beds, en-suite bathroom with shower, large terrace. 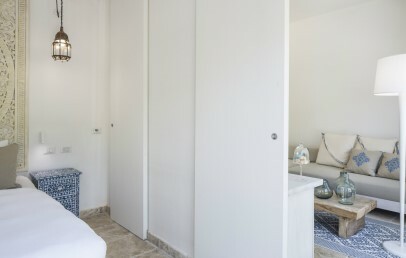 Two Bedroom Villa – two rooms with connecting door, each room with 25-30 sq.m., double bed, sofa, en-suite bathroom with shower, terrace and small garden area. Family Villa – 55 sq.m., double bed, single bed, double living room with sofa bed, en-suite bathroom with shower. Sea view with supplement. 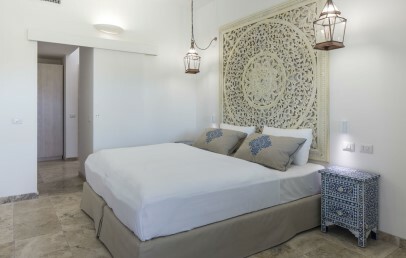 Capo Boi Suite – 95 sq.m., 2 double beds, double living room with sofa, double bathroom, large terrace. The resort offers specially-adapted rooms for guests with limited mobility. The spectacular private beach is just a stone’s throw from the hotel and can be reached by crossing the resort’s garden. The fine white-sand beach has a shallow sandy sea bed making it perfect for children. With the guarantee of total privacy, the sandy beach is framed on two sides by vegetation-covered promontories. 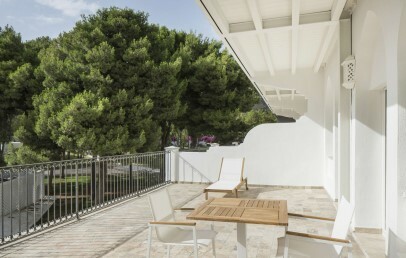 The use of parasols and sun loungers is included in the room rate. 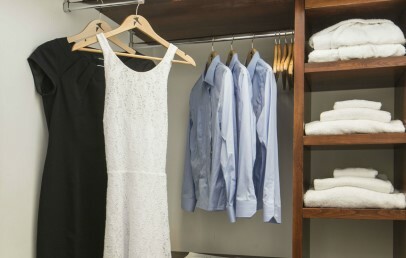 The Falkensteiner Capo Boi Resort provides guests with a beach kit, available for use free-of-charge for guests’ entire stay: bag with bathrobe, towels and slippers. The Falkensteiner Capo Boi Resort offers guests large relaxation areas and a high-quality wellness centre - Acquapura SPA: infinity relaxation pool with sea view, family activity pool, Finnish sauna, ice fountain, spa garden with relaxation area. The use of pool parasols and sun loungers is included in the room rate. Spa treatments are available to guests at an additional cost. Available for guests’ use: 2 synthetic grass tennis courts, a fitness room, a small water sports centre, diving, snorkelling, mountain biking, Nordic walking, daytime and evening sports entertainment activities for young and old. Fitness, yoga, Pilates, meditation, and aqua gym classes are also on offer. Golf lovers can head for the nearby Tanka Golf & Club with its spectacular 18-hole golf course. If you’re looking for a family resort in Sardinia, Capo Boi Resort will amaze you: you can expect welcoming family rooms, suites and villas, large indoor and outdoor spaces specifically designed for our younger guests, and Falkensteiner activities galore, all dedicated to children and teenagers. Falky Land is our multilingual entertainment programme for children aged 3 and above with recreational and sporting activities 7 days a week: cinema, mini disco, outdoor games areas, entertainment for children and teenagers, Teenie World, try-it-out sports classes and competitions for children. The qualified coaches at the “Falky Swim Academy” will guide your children from their very first stroke with swimming classes for new-borns and pre-school aged children. The resort also offers a pool reserved exclusively for families, as well as a special dining service. Guests can take advantage of our “Baby Kit” for a stress-free holiday: buggy, baby bath tub, changing table, bottle warmer, kettle and nappy disposal bin. With a large terrace, the resort’s restaurant is open all day and offers buffet dining: a generous breakfast buffet, special themed dinner buffets with show-cooking stations, barbeque evenings and a light lunch buffet (at additional cost). The restaurant has a separate Falky Area and provides special buffets designed especially for children. Guests can enjoy their lunch on the beach in the panoramic Beach Restaurant & Beach Bar. 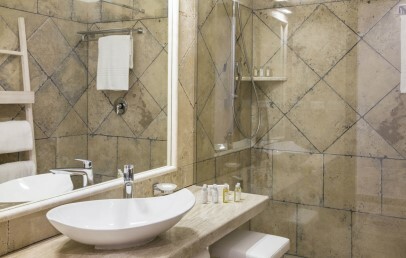 The following services are included in the room rate: parking, Wi-Fi connection, and use of the common areas – pools, sauna and steam room, gym, sun terrace, indoor and outdoor relaxation and recreational/sports areas. Laundry services and babysitting services (upon request), beauty treatments, and water sports are all available at an additional fee. Other services offered at extra cost by external partners: car and scooter hire, airport transfer service, diving centre and water sports. Tourist tax – the municipality of Villasimius requires the payment of a tourist tax of € 4,00 per person/night (excluding children under 10 years) to be paid on spot. Large rooms made up of a double bedroom and living room with a comfortable fold-out sofa bed (80x170 cm). The two rooms are partially separated and can accommodate two adults and two children up to the age of 10. Some rooms have an additional sofa. 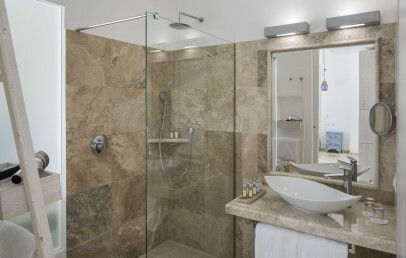 Park view family rooms all have an en-suite bathroom with shower and a balcony or terrace overlooking the resort’s garden. 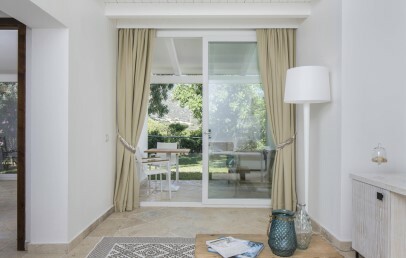 Large family suites located in the garden, split into two rooms: one double room with double bed and an additional room with two single beds (90x200 cm). 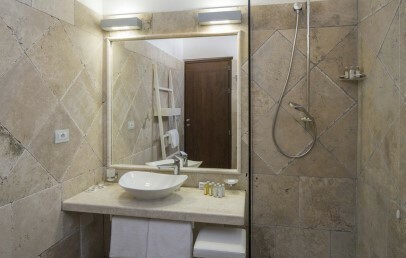 Family suites offer an en-suite bathroom with shower and hair dryer and a large 21 sq.m. terrace. Comfortable double rooms with a double bed. The Junior Suites also have a day area with a fold-out sofa bed (80x200 cm) that can accommodate a child aged up to 10 years. Some rooms have an additional sofa. 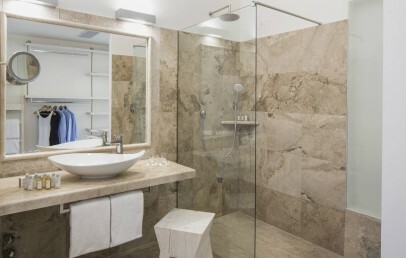 The en-suite bathroom offers a shower and hair dryer. All have a balcony or terrace with delightful views over the sea. Comfortable double rooms with a double bed. The Junior Suites also have a day area with a fold-out sofa bed (80x200 cm) that can accommodate one child aged up to 10 years. Some rooms have an additional sofa. 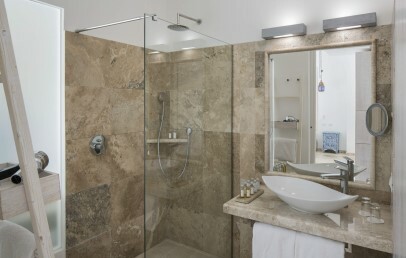 The en-suite bathroom offers a shower and hair dryer. All have a balcony or terrace with view on the sea side.